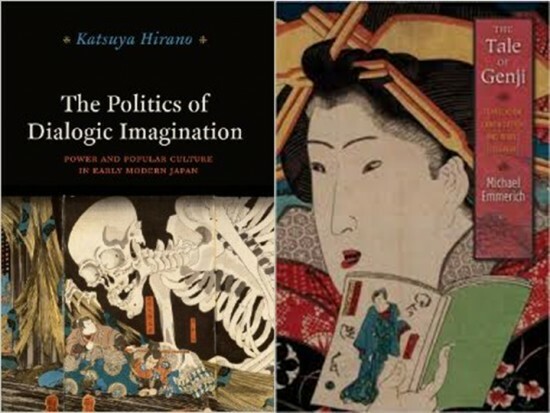 Left: “The Politics of Dialogic Imagination: Power and Popular Culture in Early Modern Japan” by Katsuya Hirano. Right: “The Tale of Genji,” translated by Michael Emmerich. Professors Katsuya Hirano and Michael Emmerich, two new Japanese studies faculty members at UCLA, will discuss new developments in early modern and modern Japanese literature, history, and popular culture on Monday, Oct. 21, from 7 to 9 p.m. at The Japan Foundation, 5700 Wilshire Blvd., Suite 100, Los Angeles. They will be introduced by Professor Hitoshi Abe, director of the UCLA Terasaki Center for Japanese Studies. The moderator will be Professor Seiji Lippit, associate director of the Terasaki Center. Hirano, a specialist in 17th-to-19th-century Japan who has been on faculty at Cornell since 2006, will be joining the UCLA History Department. Born, raised and educated in Japan until graduate school, he studies the connection between politics, culture and the arts during Japan’s Edo period. His forthcoming book, “Politics of Dialogic Imagination: Power and Popular Culture in Early Modern Japan, 1750-1890,” which is due in November from University of Chicago Press, seeks to understand why Edo-period shoguns, with their seemingly unrivaled power, tried so hard to regulate the ostensibly unimportant popular culture of the day, including fashion, leisure activities, prints and theater. Hirano is currently writing a book about the Japanese colonization of lands originally belonging to the Ainu people, who are indigenous to a string of islands between mainland Japan and Russia. In addition to his expertise on court-centered writing from the period, Emmerich is an authority on Japanese fiction from the 19th century onward, including the works of modern and contemporary authors. He also is a prolific translator of contemporary Japanese authors, from Nobel prize winner Kawabata Yasunari to best-selling cult writer Banana Yoshimoto. To RSVP or for more information, call (310) 825-4500, email [email protected] or visit www.international.ucla.edu/japan.